If you’re a local pool owner, it’s imperative you have a professional pool cleaning service in Palm Harbor that will maintain the health of the water and chemicals. Florida weather can present different ailments, some of which could affect the condition of your amenity. Knowing that there are services such as the ones offered by Triangle that will help guide you through these situations can come in handy. 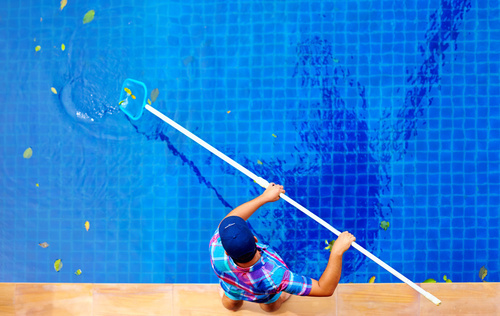 As a result of our top quality cleaning, inspecting and repairing methods, we’re recognized as being one of the best pool companies in the Bay Area. We pride ourselves on providing world-class service, no matter how large or small your amenity is. Our technicians will adhere to whatever is affecting your treasured oasis and seek the proper solutions to cleaning it out. Our mission is to make sure that your amenity is free of anything unhealthy and uninviting; making us known for our professional pool cleaning service in Palm Harbor. As a result of being in the trade since 1959, we understand everything and anything that could be causing your amenity to be in less than peak condition. One may mistake us for being old-fashioned, having been in the pool cleaning service for almost 59 years. Contrary to that assumption, we’re pioneers in the latest innovative technology. We do not use outdated methods of cleaning, managing and repairing. Our staff is full with experienced and very knowledgeable associates. We’re active in obtaining the latest equipment and hardware. What makes our service different from the others is that we apply our enriched passion for cleaning. Our pros have vast understanding of to maintain a pool, and produce top quality service for all our clients that is holds value long after we leave. We sometimes get questions asking why there is a real need for a pool cleaning service in Palm Harbor. We love to inform our clients of the dangers of not having proper maintenance. Not for the reason of shocking them, but rather bringing attention to repercussions of not keeping up with these responsibilities. There are countless stories of people who thought they could get by skipping regular chemical and pH level checks. Some thinking if nothing looks to be wrong that there is no harm. Unbeknownst to what you can’t see; the condition of the interior and exterior can deteriorate and wear down, allowing the material to corrode welcoming bacteria to inhabit the water. Without pool cleaning service in Palm Harbor this may lead to algae or even total replacement of the material. Swimming in these waters can also cause dryness and itchy skin, and other potential health risks. For these reasons, we justify our cause to helping out anyone who is in need of a pool cleaning service. Not just in Palm Harbor, but the surrounding Bay Area as well. We know that having clean, healthy water adds an inviting factor for guests as well as for your own enjoyment. To most owners, a pool is an oasis, an escape, a home away from home. An unclean amenity often deters people from enjoying their backyard to even avoiding it all together, believing it to be a lost cause too expensive to fix. Triangle assures clients that nothing is ever too expensive nor beyond help with the assistance of our services. We will outline a plan of action and customize it to your needs. Our technicians will always be on call just in case there is any concern that you feel needs to be addressed. Call us today at (727) 531-0473 to see how our pool cleaning service in Palm Harbor and the surrounding Tampa Bay area can be of assistance to you!